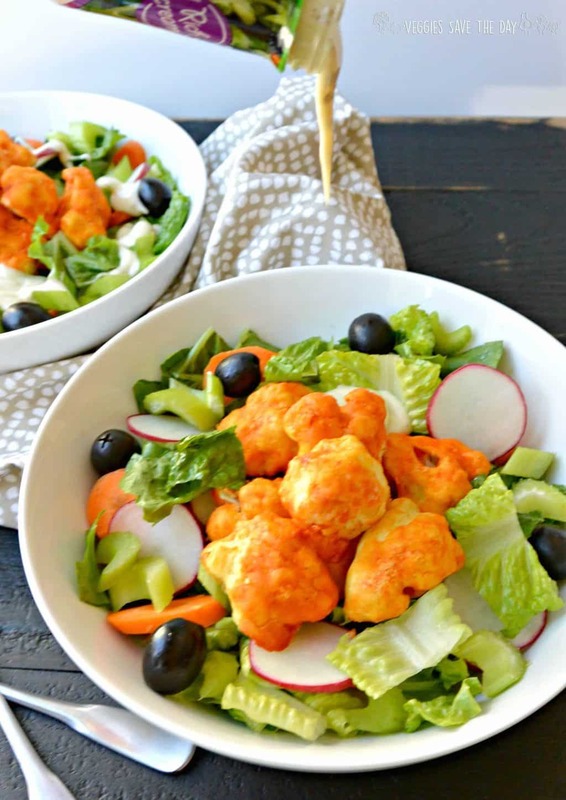 Buffalo Cauliflower Bites Salad turns the popular appetizer into a healthy meal. It’s naturally vegan, gluten-free, and easy to make in about 45 minutes. 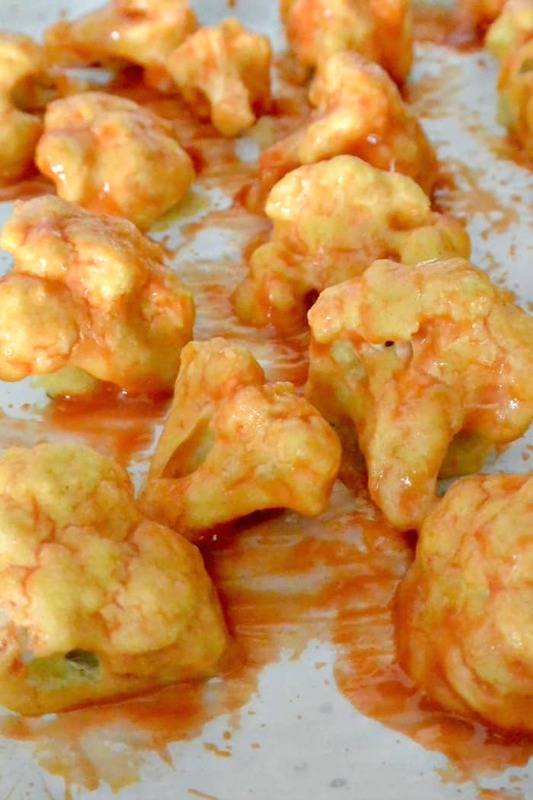 I’m sure you’ve heard of buffalo wings, but have you tried buffalo cauliflower? Talk about a wonderful plant-based alternative! It’s no wonder it’s seen on so many restaurant menus these days. Traditionally, buffalo cauliflower is served with blue cheese dressing, but I’m partial to ranch. I love the combination of spicy hot sauce with cooling ranch, like in one of my favorite salads Buffalo Ranch Chickpea Taco Salad. 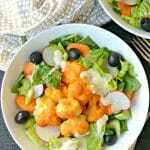 But anyway you choose to serve it, Buffalo Cauliflower Bites Salad is delicious! 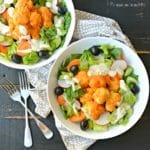 I took my favorite buffalo cauliflower bites and added them to a salad for a satisfying and healthy meal. Cauliflower is one of my favorite ingredients. There are so many dishes you can make with it, from Warm Cauliflower Salad with Brussels Sprouts to Cauliflower Ceviche to Cauliflower Curry Grill Packets. And it’s so easy to work with. 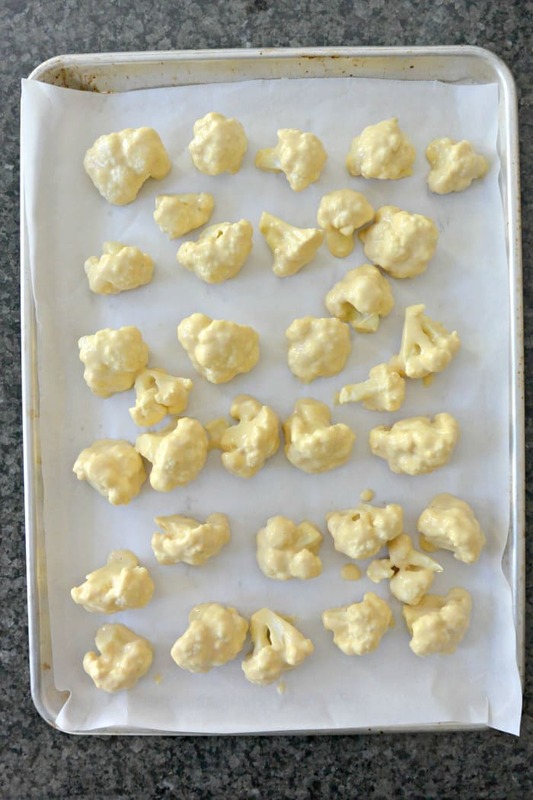 For Buffalo Cauliflower Bites Salad, first I bake spicy coated cauliflower florets in the oven. Then I add them to a salad with carrots, celery, radishes, and olives. Finally, I top everything with some non-dairy ranch dressing for a delicious and filling main-dish salad. Sometimes I use store-bought dressing, but if I have time, I love making homemade Cashew Ranch Dressing. I first tried making cauliflower “wings” using the recipe from The Prevent and Reverse Heart Disease Cookbook. After a few times, I modified the recipe a little and starting serving it with ranch dressing. Then after trying the cauliflower bites in a salad, I was hooked! Now it’s one of my favorite easy meals. In order to make the Buffalo Cauliflower Bites, only a few ingredients are needed. And you won’t believe how easy it is to make! 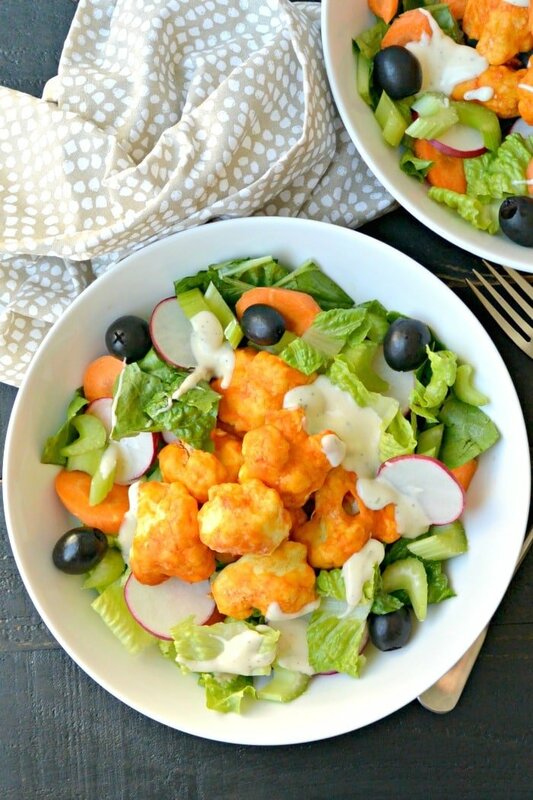 Top Buffalo Cauliflower Bites Salad with your favorite veggies and make it your own! As I mentioned, my favorite additions to this big salad are carrots, celery, radishes, and black olives. But you can customize it with your preferences. Other options include cherry tomatoes, avocado, and corn. Or boost it with some beans such as chickpeas or black beans for extra protein and fiber. You can also try it with other salad dressings such as Vegan Green Goddess Dressing or Vegan Avocado Ranch Dressing. And now it’s time to make Buffalo Cauliflower Bites Salad! 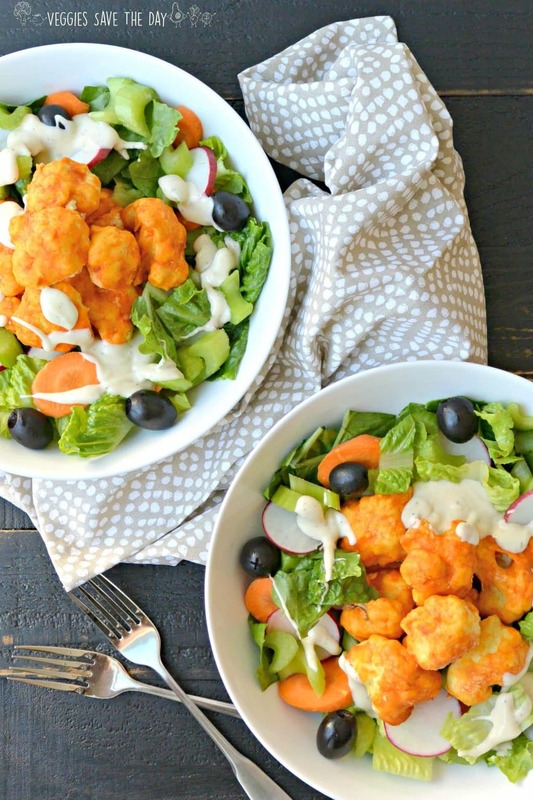 Buffalo Cauliflower Bites Salad turns the popular appetizer into a healthy meal. It's naturally vegan, gluten-free, and easy to make in about 45 minutes. In a large bowl, combine the chickpea flour, garlic powder, and non-dairy milk. Mix well to combine. Dip each cauliflower floret in the chickpea flour batter. Shake to remove excess and place each piece on the baking sheet. Bake the cauliflower for 20 minutes until lightly browned. Remove the tray from the oven and pour the hot sauce over the cauliflower, making sure each piece is covered with the desired amount of sauce. Return the tray to the oven and bake for 10 minutes longer. Remove from the oven and set aside. Prepare your salads in individual bowls by adding the lettuce and vegetables. 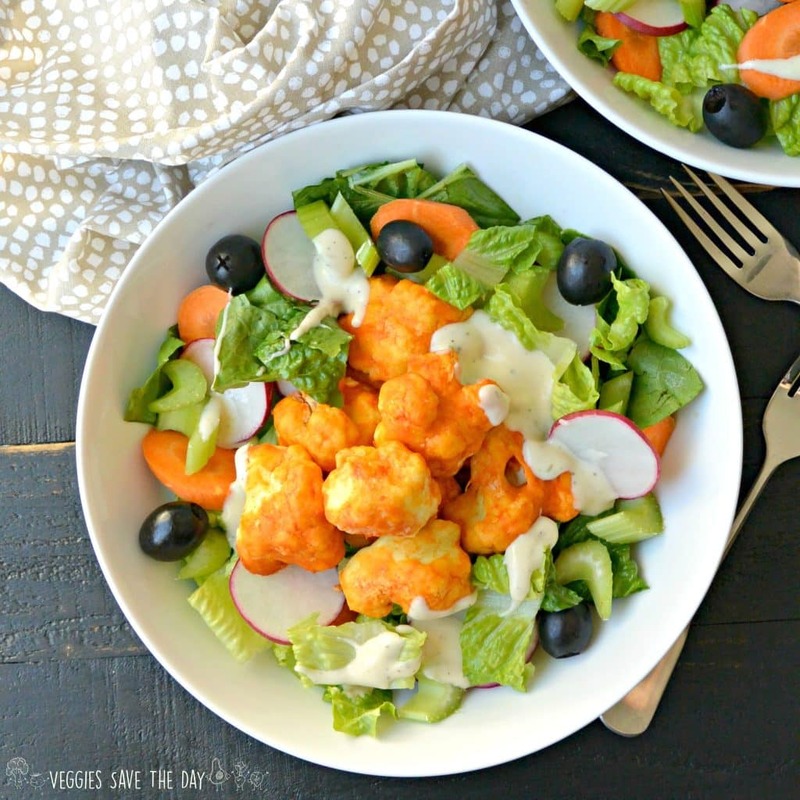 Top each salad with some buffalo cauliflower bites. Add some salad dressing and enjoy immediately. Nutrition Facts do not include the optional toppings or ranch dressing. To make your own vegan ranch dressing, I recommend this oil-free Cashew Ranch Dressing.